As the Nation's energy resources continue to be examined for development, it is critical that a digital database exist that contains location data for all Federal land and mineral resources. The U.S. Geological Survey (USGS), in cooperation with the Bureau of Land Management (BLM), is collecting these ownership files and compiling them in Environmental Systems Research Institute, Inc. (ESRI) ARC/INFO coverages, to form a standardized data library. A coverage is a digital version of a map in the form of vector data storage. These coverages are combined with models of coal deposits from the USGS National Coal Resource Assessment project, a five-year effort to identify and characterize the coal beds and coal zones that will provide fuel for the Nation’s energy needs during the first quarter of the twenty-first century. Geographic and geologic data layers are integrated in a Geographic Information System (GIS) to answer complex geo-spatial questions concerning coal resource occurrence. The Powder River Basin (PRB) has the largest in-place coal resources of any field in the contiguous United States (Keystone, 1997), and produces over one-fourth of the Nation's total coal production (The Mining Record, 1997). Because of the importance of coal production in the Powder River Basin, its possible impact on other land uses, and the high potential for increased PRB production in the future, the public, Federal Land Management Agencies (FLMA), scientists, and decision-makers need access to geographically referenced information concerning coal ownership and location. In the Powder River Basin, very little of the surface is Federal land, yet almost all of the coal is Federally owned. It is important to know the location of Federal coal; this information can be used with National Coal Resource Assessment information on coal thickness, depth, quality, and other factors to arrive at volumes of Federal coal in the Powder River Basin. These data can be combined with spatial data for mines, roads, and restricted areas for USGS Coal Availability and Recoverability studies where major constraints on the availability of coal resources for development are identified, and where recovery and cost factors are applied to the estimated available coal resources. It is important to understand the location and distribution of Federal mineral resources; these spatial data sets also include Federal oil and gas and other Federal minerals, as well as land status and Federal coal. Users of these data need information about the data, i.e., its source, scale, process steps, etc., to determine its usefulness in a particular application. Factors about the data that users would need to know are included in our Federal Geographic Data Committee (FGDC)-compliant metadata documents. This report provides a way to summarize a package of spatial data sets and a format for organizing the information so that it can be accessed and used efficiently. This report explains to users where they can find the data, how to access them, what each file includes, and provides an immediate graphical representation of the data in an ArcView project. The Powder River Basin ownership and associated digital data in this report are contained in ARC/INFO coverages. The coverages store map features and associated feature attribute tables to create a set of thematically associated data considered as a unit. 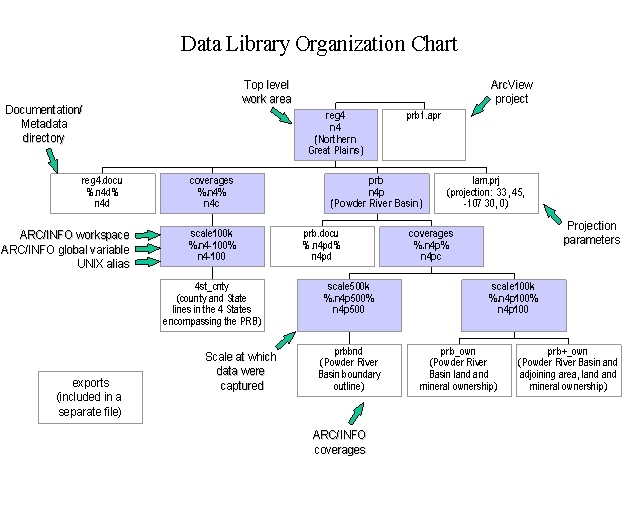 The ARC/INFO coverages are contained in workspaces stored in a structured data library located at the USGS in Denver, CO. A brief description of the data structure is described in "Database Management, Design and Organization". The ArcView project has been designed for maximum utility on a variety of computer platforms. Initial compilation was done on an Intel Pentium platform running Windows NT. ArcView GIS software, a product of Environmental Sytems Research Institute, Inc., is a desktop GIS with an easy-to-use, graphical user interface that lets a user load spatial and tabular data to display the data as maps, tables, and charts. ArcView provides tools to query and analyze the data and present results as presentation-quality maps. The ArcView project included in this report can be opened in either ArcView 2.1 or later versions of ArcView 3.0 on UNIX, Windows-based PCs, or Macintosh platforms. Appendices 1 through 4 provide a brief description of each coverage, and a list of coverages and tables (as well as the items within the tables) contained in each ArcView project view. More detailed information can be found in the formal metadata associated with each coverage. Before this data compilation, the original ownership data resided in many district and State offices of the BLM, in different formats, at varying scales, and for particular areas of interest. Some areas had no digital ownership coverage; in such cases, the USGS is creating the files in high-priority energy resource assessment areas. This GIS data set of surface and Federal mineral ownership in the Powder River Basin area, Montana and Wyoming, is the combination of several ARC/INFO coverages and MOSS format files that were collected from the BLM and reformatted as needed, or were created by the USGS from hard copy BLM 1:100,000-scale surface and mineral management status maps. The data structure of the files included in this report is one component of the larger USGS Regional/National Coal Assessment Data Library. It parallels the Regional/National structure that resides on a UNIX server in the Central Regional Office in Denver, CO. The database is organized into a hierarchical structure with the top level directories containing general work areas that define an area of geographic extent. Work areas provide an umbrella to store "workspaces" containing ARC/INFO coverages as well as other types of files. parameters used in a GIS workspace to georeference or register the digital information to the surface of the Earth for accurate overlay, analysis and resource calculations. Because the directory structure organizes spatial information, scale and resolution of the data is an important factor in arranging the hierarchy of a spatial data repository. These give an immediate identifier to the level of detail based on the scale at which the data were captured. Resolution is directly related to the accuracy and obviously important in analysis and interpretation. Multiple scales are necessary to adequately display differing National, regional, and site-specific products and analyses. This type of grouping of coverages provides a more useful means of storage than including the resolution of the data in the coverage name. To do the latter may pose a problem in that the filenames can become very long. To help increase efficiency and avoid typing long path names, global variables were developed and are included in this report in a file named stat_nca. Included also, in the file alias.txt, are aliases that expedite moving through the directory structure at the UNIX system level. The use of the global variables, aliases and the ARC/INFO startup file will be discussed in the section entitled "UNIX Platform Considerations". Figure 1. Directory structure of the Powder River Basin files included in this digital publication. This chart illustrates an example of the directory structure of the USGS Regional/National Coal Assessment Data Library. Shaded boxes highlight paths to ARC/INFO coverages. The filenames are significant, descriptive, and designed to be intuitive. They give basic thematic information and are annotated in Figure 1. For a brief description of the coverages, see Appendix 1. More detailed documentation is included in the formal metadata for each coverage. The entire suite of data files can be downloaded from the World Wide Web as a compressed archive file, prb.tar.gz, that is 11 MB in size. Additionally, Arc/Info export files are contained in another compressed archive file, exports.tar.gz, that is 11 MB in size. The files were archived with the UNIX TAR utility and compressed with the UNIX GZIP utility, and can be extracted and used with ArcView under UNIX, Windows 95/NT or Macintosh, and/or with ARC/INFO, and/or with ArcExplorer GIS data browser (which can be downloaded free from http://www.esri.com). The ARC/INFO export files can be used with software programs that can accept that format. Save the file to disk on your computer in your preferred directory. STEP2. Run the extraction utility. Special utilities (available for UNIX, Windows 95/NT, and Macintosh) are needed to extract the data and the ArcView project file from the GZIP and TAR formats. For Windows95/NT you may download from the web site where the data resides (http://energy.cr.usgs.gov/fedland/prb_own.html), a free evaluation copy of winzip95.exe that extracts the data and the ArcView project file for use with ArcView on Windows platform. The utility is self-extracting/installing. For Macintosh you may download from the same location, freeware copies of MacGzip1.1.2 / Suntar2.1.4 that extract the data and the ArcView project file for use with ArcView on Macintosh platform. After installing the utility on your Windows or Macintosh system, the GZIP and TAR utilities can be accessed by simply double-clicking the utility icon or by double-clicking the icon for prb.tar.gz. Note: On a Macintosh platform, after selecting a file to unTAR, a window may appear that contains an option to convert NL (new line) to CR (carriage return). Do not select this option. The data files and the ArcView project file are automatically extracted in the necessary directory structure that will allow the ArcView project to run. Any changes or movement of files within the directory structure may result in ArcView not performing optimally. See the section entitled "The ArcView Project -- Recommendations and Dependencies". See Figure 1 for a diagram of the directory structure. readme.doc - this readme file in a Microsoft Word for Windows version 7 document. exports – contains ARC export files for each of the coverages included in this report. Provided for import of data into software packages that can read this format. The ArcView project (prb1.apr) was designed for maximum utility; it was created using ESRI ArcView GIS software Version 2.1 and can be opened in either ArcView 2.1, ArcView 3.0 or later versions. The output of an ArcView analysis is the "project" file that by convention carries the .apr extension. After you have successfully extracted the data files, it is important to keep the directory structure intact as provided so that ArcView can locate the associated coverages (that is, with the ArcView project stored at the same directory level as the reg4 directory). The directory structure is the key or pathway for ArcView to locate and display themes. Moving the ArcView project relative to the data will require editing to adjust paths stored within the project file or development of system-specific environment variables for ArcView and the system properties. Additionally, if the project is saved before exiting, it is recommended that the project be saved to a new file. Saving the project before exiting will alter entire paths to the associated coverages in the project file; this can be significant if the project is subsequently moved to another directory or computer system. For example, the paths in this ArcView project file begin with the top-level directory, i.e., reg4/prb/coverages/scale100k/prb_own. Whenever an ArcView project is saved, complete paths to where the data reside are placed in the ArcView project file. If the user downloads this suite of files to the d: drive and saves the ArcView project, the path listed above is now altered to d:/ reg4/prb/coverages/scale100k/prb_own. Once the ArcView program is started, click on the File pulldown menu and select Open Project. Select the appropriate drive in the lower right of the Open Project window, then select prb1.apr and click on OK. When the project is open, you will see the application window that contains the ArcView user interface. Like all the windows in ArcView, you can move, resize, minimize, or maximize this window. This ArcView project was developed using 16-bit color. Set your monitor to that setting or greater for the best viewing. On both Macintosh and UNIX platforms, we found that the original application window may need to be enlarged slightly by dragging the upper right or lower right corner. The application window contains a View document window that partially overlies the Project window. The Project window displays the names of all the documents contained in this ArcView project. The ArcView user interface consists of menus, buttons, and tools arranged in three bars at the top of the application window. Along the bottom of the application window is the status bar. When you place the cursor over a button or tool, the status bar displays a one-line description of the operation it performs. The first view is a land status map of the Powder River Basin area. Selection Tool -- Making Windows Active: Use the left mouse button to click on the black arrow (the selection tool) in the tool bar. Use the selection tool to click anywhere in the Project window to make it active. In the white portion of the Project window are a list of views, each of which contains a display. The views contain two groups of coverages; the selection of attributes vary to show different categories of surface and mineral ownership in each view. By double-clicking with the mouse button on the name of a view, that view becomes active. Sequentially display each of the eight figures to view land status, Federal surface management, Federal coal ownership, and Federal oil and gas ownership in and around the Powder River Basin. See Appendix 4 for an overview of abbreviations and codes used. The data files that make up each view are referred to as "themes" in ArcView. Themes are synonymous with ARC/INFO coverages or ArcView shapefiles. The theme names appear along with the legend information in a gray box to the left of the view, and in this ArcView project, serve as a short description of the coverage. See Appendix 2 for a list of project views and the coverages contained in each. Theme Properties: To see the coverage name and path, as shown in the Data Library Organization Chart (fig. 1), click with the left mouse button in the general vicinity of a theme in the legend box. The theme name and its associated legend become a raised box. Now click on the word Theme in the menu bar along the top of the View user interface to activate a pull-down menu. Select Properties from the pull-down menu. The source is shown when the Definition tool (in the left margin of the Theme Properties window) is highlighted. A single click with the left mouse button on the icon containing a hammer and a question mark (Query Builder) lists the fields in the active theme. Each field is an attribute that can be queried for spatial analysis. Each attribute is described in Appendix 4 and is explained in detail in the metadata associated with each coverage. In the Query Builder window, click in the box to the left of Update Values to place a check mark in the box and make it active. Now double-click any field with the left mouse button to see all of the values stored in the selected field. Cancel the Query Builder and Theme Properties windows to return to the View tools. Identify Tool: The leftmost tool in the View tool bar is the Identify tool. This tool contains the letter "i" inside a black solid circle, and can be used, for example, to identify specific attributes. A critical aspect of this report is the documentation of the digital layers or themes. As a result of the 1994 Executive Order 12906, metadata (information about the data, i.e., it’s source, scale, process steps, etc.) documentation is required for all "new" (post-1994) digital spatial information generated by U.S. Government agencies. Such documentation augments utility, educates people about the data, assists them in determining its usefulness, and helps track content and data quality. Metadata is being organized by the Federal Geographic Data Committee (FGDC) into a National clearinghouse of digital information named the National Spatial Data Infrastructure (NSDI). NSDI serves as a metadata repository, provides pointers to accessible digital information, reduces digital compilation effort within the Federal Government and Public sector and provides a forum for exchange of data and ideas. For each of the coverages included in this report, FGDC-compliant metadata have been compiled using several tools including: ESRI’s DOCUMENT.AML, a text editor, and tools developed by the USGS including CNS, XTME, and MP (http://geochange.er.usgs.gov/pub/tools/metadata). The metadata are stored in an ASCII text file in each of the subdirectories, reg4.docu or prb.docu, at the level where the coverages reside. (All coverages stored below the prb top-level directory have metadata files in the subdirectory prb.docu). The metadata filenames are ‘coveragename’.meta, i.e., metadata for the coverage prbbnd is named prbbnd.meta. The process was more efficient and successful by using DOCUMENT.AML only to extract pertinent information from the coverages. The DOCUMENT CREATE command in ARC/INFO allows the user to capture and extract metadata information from the coverage. The information processing done by DOCUMENT CREATE includes converting and reporting the bounding coordinates in latitude and longitude decimal degrees, reporting of the native dataset environment, calculating and reporting the spatial data organization information and spatial reference information, and reporting some of the entity and attribute information and metadata reference information. That information is also written to INFO files associated with the coverage. Once CREATE is complete, the user quits that DOCUMENT option, and runs another DOCUMENT option (FILE) to create an ASCII metadata file from the INFO files created during DOCUMENT CREATE. The resultant ASCII metadata file can then be referenced while using other tools that proved to be more appropriate for entering the additional metadata information. The software tools developed by the USGS (XTME, CNS and MP) ensure that metadata are structured appropriately for the NSDI. XTME creates a metadata template that can be filled in while in the program or saved and edited using a text editor. Use of a text editor simplifies cutting and pasting information that might be in unformatted documentation files and in the ASCII text file saved from running DOCUMENT FILE. Users can transfer metadata files in and out of XTME and the text editor as needed. CNS (chew and spit) is a utility that formats the data for XTME and MP and stores any additional information into leftovers. CNS proved to be a critical tool for formatting FGDC-compliant metadata. MP is used upon completion of creating metadata. MP scans the metadata document and reports by line number any errors that were encountered. With a text editor, the user can then isolate and correct those errors, and rerun MP. Occasionally running CNS again on the metadata file immediately before running MP will correct some of those errors (that is, errors caused by inappropriate formatting). MP can also be used to write the metadata file in ASCII, HTML, SGML, or DIF formats. Printing of metadata from a word processing program gives better results than simply printing the raw ASCII text file, in that the word processing program will force long lines of text to wrap rather than get truncated. The global variables, as mentioned in the section entitled "Database Management, Design, and Organization", provide an efficient way to access coverages in a hierarchical structure. They eliminate unnecessary typing, and allow a user to process coverages in workspaces other than in the one the user is currently working. The global variables are activated on a UNIX machine by first performing a global edit on the paths in the file stat_nca. One can change /coal2/nca/ to be the entire path, including the name of the disk, to where the reg4 top-level directory was downloaded. For instance, if the files are housed in a subdirectory you named prb (for Powder River Basin) in your home directory on a SUN server, change /coal2/nca/ to /home1/(username)/prb/. Next, copy stat_nca to $ARCHOME/stations/stat_nca, and put the .arc file (a startup file) in your home directory. Normally only the system administrator has "write" access to $ARCHOME/stations and thus will need to copy stat_nca from your directory. The .arc file contains a single command (&station nca) that activates the stations file (stat_nca) when the ARC/INFO program is started. 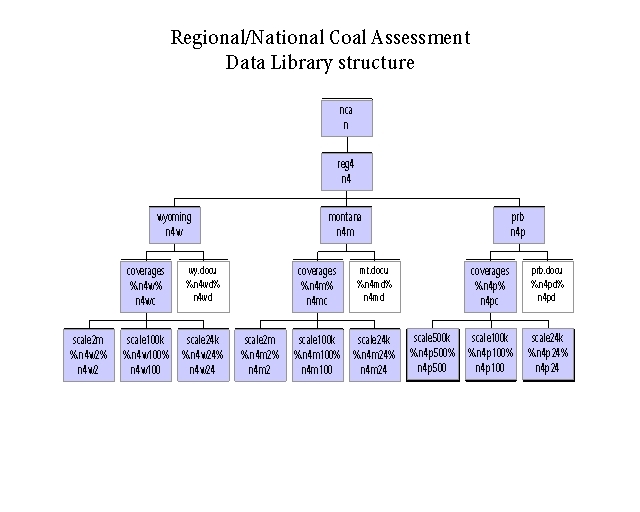 The n4 at the beginning of each alias and global variable defines the directory structure as it exists in the USGS Regional/National Coal Assessment Data Library (see fig 2). The n stands for the top-level directory of that library, nca, and the 4 stands for the next level subdirectory where Powder River Basin data reside; reg4 (for Region 4), based on defined USGS Energy Resource Regions. and associated web pages for more about the USGS Energy Resource Regions and the National Coal Resource Assessment. Figure 2. Example of the directory structure of the USGS Regional/National Coal Assessment Data Library. Margaret Ellis, U.S. Geological Survey, created the ARC/INFO coverage that defines the outline of the Powder River Basin based on geologic studies. Colorado) to create seven surface and Federal mineral ownership coverages based on the 1:100,000-scale surface and mineral management status maps published by the BLM. Corla DeBar, Montana State BLM Office, performed quality control on the digital ownership files created for the 1:100,000-scale quadrangles in Montana. Tracey Loewecke, U.S. Geological Survey, attributed Federal mineral ownership in a file to complete the ARC/INFO coverage for the Terry, MT, 1:100,000-scale quadrangle. Carol L. Molnia, Timothy J. Rohrbacher, and Katharine L. Varnes, U.S. Geological Survey, reviewed the manuscript and offered thoughtful and constructive comments. Cheryl W. Adkisson, U.S. Geological Survey, prepared the World Wide Web release. Environmental Systems Research Institute, Inc., Redlands, CA 92373 USA. Keystone Coal Industry Manual, 1997, Chicago, IL, Intertec Publishing Company, 800 p.
Love, J.D. and Christiansen, A.C., 1985, Geologic map of Wyoming: U.S. Geological Survey, scale 1:500,000. The Mining Record, International Mining News, 1997, (newspaper) "Powder River is the largest U.S. coal mining company": Volume 108, Number 24; June 11, 1997, Englewood, CO, The Mining Record Publishing Company, Toll Free: 1-800-441-4748, Tel: (303) 770-6791. Ross, C.P., Andrews, D.A., and Witkind, I.J., compilers, 1955, Geologic map of Montana: U.S. Geological Survey and Montana Bureau of Mines and Geology, scale 1:500,000. U.S. Bureau of Land Management, 1980, Surface and mineral management status map, Lame Deer quadrangle, Montana, scale 1:100,000. U.S. Bureau of Land Management, 1981, Surface and mineral management status map, Birney quadrangle, Montana, scale 1:100,000.U.S. Bureau of Land Management, 1982, Surface and mineral management status map, Lodge Grass quadrangle, Montana-Wyoming, scale 1:100,000. U.S. Bureau of Land Management, 1982, Surface and mineral management status map, Terry quadrangle, Montana, scale 1:100,000. U.S. Bureau of Land Management, 1987, Surface and mineral management status map, Hardin quadrangle, Montana, scale 1:100,000. U.S. Bureau of Land Management, 1989, Surface and mineral management status map, Bill quadrangle, Wyoming, scale 1:100,000. U.S. Bureau of Land Management, 1989, Surface and mineral management status map, Newcastle quadrangle, Wyoming, scale 1:100,000. U.S. Bureau of Land Management, 1990, Surface and mineral management status map, Broadus quadrangle, Montana-Wyoming, scale 1:100,000. U.S. Bureau of Land Management, 1990, Surface and mineral management status map, Midwest quadrangle, Wyoming, scale 1:100,000. U.S. Bureau of Land Management, 1990, Surface and mineral management status map, Miles City quadrangle, Montana, scale 1:100,000. U.S. Bureau of Land Management, 1991, Surface and mineral management status map, Lance Creek quadrangle, Wyoming, scale 1:100,000. U.S. Bureau of Land Management, 1992, Surface and mineral management status map, Powderville quadrangle, Montana, scale 1:100,000. U.S. Bureau of Land Management, 1993, Surface and mineral management status map, Forsyth quadrangle, Montana, scale 1:100,000. U.S. Bureau of Land Management, 1993, Surface and mineral management status map, Hysham quadrangle, Montana, scale 1:100,000. U.S. Bureau of Land Management, 1993, Surface and mineral management status map, Lusk quadrangle, Wyoming, scale 1:100,000. U.S. Bureau of Land Management, 1994, Surface and mineral management status map, Sundance quadrangle, Wyoming, scale 1:100,000. U.S. Bureau of Land Management, 1995, Surface and mineral management status map, Douglas quadrangle, Wyoming, scale 1:100,000.